Think of all the movies with iconic scores. Star Wars, Jurassic Park, Jaws, Indiana Jones, and Psycho are all made even better by the perfect placement of song and story. But not every movie gets the John Williams or Hans Zimmer treatment. Some are stuck with Stan Bush. While music can make a film, it can also ruin it. Your expectations for the score of the original Transformers animated film were probably pretty low. Mostly because it was an '80s cartoon, which weren't typically known for their fine musical choices. But Transformers doesn't just pick a dumb '80s actions song. It has a whole score by Stan Bush. If you're not familiar with Bush, he makes power rock songs that would be considered too cheesy to show up in a Rocky sequel. The audience is treated to the song "Dare" early in the film, urging us to all dare to keep our dreams alive, but the most out-of-place moment comes with Bush's biggest hit. As Optimus Prime comes down to Earth, the filmmakers thought that was a great place to put "The Touch." If you watch the clip above, you'll see that there's absolutely no lead in to the song. 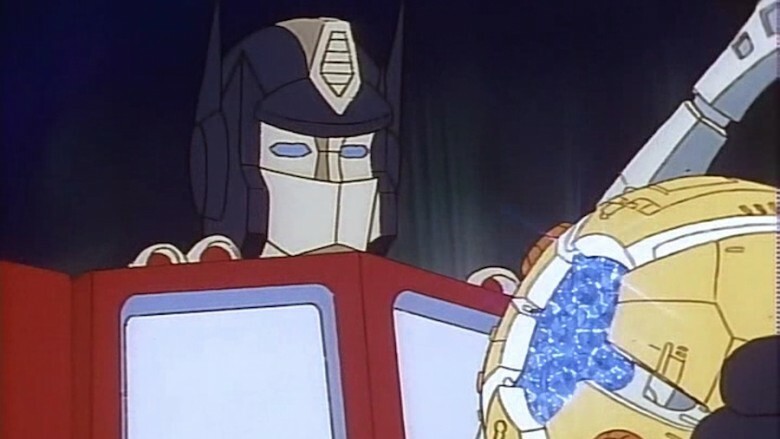 Sure, one could say that Optimus Prime "has the touch, [he's] got the power" as the song sings, but it just doesn't fit. Also, Prime then just runs a bunch of people over, which we probably wouldn't describe as a "touch" but more of a "violent pummeling." The first Ninja Turtles movie wasn't exactly a gritty exploration of the world of deformed turtles in the throes of puberty, but it had a touch of griminess, and if you were a kid who was into the Turtles, you liked the movie just fine. With the sequel, they managed to make a world set mostly in sewers and dealing with nuclear waste very bright, colorful, and seemingly more kid-friendly. They made it worse. One clear way you can see the decline in quality between the sequels is the difference between the soundtracks. The first film had "Turtle Power" by Partners in Kryme, a pretty catchy theme. Secret of the Ooze had Vanilla Ice. The Turtles get into a break dance fight in a club while Ice's "Ninja Rap" plays. Is it considered double white washing when a lame white guy raps about ninjas? The rest of the soundtrack is high-energy hip-hop that feels like it's trying to be the most '90s it can possibly be. Even for kids, the songs are dumb, and whenever Vanilla Ice is your highlight, you know you're in trouble. Wouldn't it be funny if there was a movie about medieval knights but there was a pop music score? The answer is: no. A Knight's Tale has an incredible cast of Heath Ledger, Rufus Sewell (Dark City), Paul Bettany, Alan Tudyk, and Mark Addy (Robert Baratheon in Game of Thrones), which goes to complete waste, and the soundtrack doesn't help matters. What's a good song for a knight learning how to joust? Well, "Lowrider" of course. During a scene of violent sword fighting, there's really nothing more appropriate than "Taking Care of Business" by Bachman Turner Overdrive. And when the knights march into battle, you've got to play "We Will Rock You," it just screams medieval swordplay. The problem with these songs isn't just the anachronism. They're plain bad choices. Each song is the most obvious oldie hit, as if they found a copy of "Now That's What I Call Classic Rock" and let it play in its entirety while editing. Plus, the knight learning to joust has nothing to do with lowrider, he's not really taking care of business, and "We Will Rock You" is simply inaccurate—the movie gives us a light nudge perhaps but doesn't come anywhere close to rocking someone. This is a perfect example of a film that might have been a nice little comedy with a great cast but was ruined by its distracting score. Using all Beatles cover songs will always rile up a few fans. But Across the Universe uses the songs so strangely, it's hard to imagine any fan leaving the theater happy. The story goes into moody love affairs between young artists and the injustices of the Vietnam War, but mostly it leaves the audience thinking "Why did they put that song there?" The film vacillates between surrealistic and bold visual interpretations of the music to super literal "let's show how people come together so we can sing 'Come Together'" type songs. Plus, Across the Universe did not learn from Sgt. Pepper's Lonely Hearts Club Band. Both films have random celebrity song cameos and it doesn't work in either (though Sgt. Pepper's is much worse. It has George Burns singing "Fixin' a Hole"). Tootsie is an amazing comedy that holds up today just as well as when it came out in 1982 … except for the soundtrack. Tootsie is a surprisingly insightful look into gender relations and the world of show business as a whole, but then out of the blue, the kids Casio and sax soundtrack will kick in, sounding like the background of an '80s ladies pantyhose commercial. That doesn't even count the cheesy love ballad "It Might Be You" that serves as the film's signature song. This classic movie is a rare comedy that was nominated for Best Picture, and it won Jessica Lange a Best Supporting Actress award, yet the soundtrack sounds better suited to a Police Academy sequel. Say what you will about the controversy between Ray Parker Jr. And Huey Lewis over the original Ghostbusters theme, but it's a super catchy song. Sadly, Bobby Brown was not able to capture the same magic for the sequel, and the result was the lackluster "On Our Own." Though that song isn't great, it's not nearly as distracting as RUN DMC's version of "Ghostbusters." The ghost busting quartet doesn't make a great fit for a hip-hop restyling of their theme song, and to make things worse, it's just a bad RUN DMC song. Then, after all that late '80s rap and R&B, the biggest moment of the film is scored to "Higher and Higher" by Howard Huntsberry. Now, this is a great song, but the straight cover of a pop hit from 1967 doesn't fit with any other music from the film. Also, it stands out because it's a good song, which makes it crazy different from any other music in the movie. Here are two ideas that both make sense. Idea one: a horror film anthology that's connected by a vampire character played by Vincent Price. Idea two: a movie about a punk rock/reggae club in the '80s for the fringes of society. Put these ideas together? You get Monster Club. Unfortunately, these two completely separate movie premises work together just as weirdly as you might think. For all 90 minutes, we go between somber horror stories, Vincent Price's Vincent Priceyness, and then vaguely Heart-sounding performance numbers. The film doesn't wait long to begin their insanely out-of-place song choices. After a long scene between Vincent Price and John Carradine where they properly discuss the actual existence of monsters and vampires, we smash cut to saxophone and a lot of people in bad monster masks. Thus, begins "Monsters Rule, okay" the punkish theme that doesn't match with anything we've seen up to that moment. As the movie goes on, the performance numbers don't really comment on the stories or let us know much more about monsters. They were probably bands the director was friends with, so he shoved them in the film. It's not all bad, since in the end we get a scene with Vincent Price dancing to a laid back reggae song called "The Monster Club." And this soundtrack can be a real lifesaver if you're sick of playing "Monster Mash" on Halloween. How bad could a comedy starring Chevy Chase, John Candy, and Dan Akyroyd be? Bad. Really, really bad. Nothing But Trouble is all over the place but mostly concerns a jerky Chevy Chase getting stuck in a small town for a traffic violation. But Dan Akyroyd, who runs the town, is crazy and has a habit of killing all the criminals that pass by. Also, John Candy plays two characters, one male and one female, Aykroyd is covered in horrifying makeup, and the whole town bursts into flames at the end. To make all that even weirder, the soundtrack makes no sense. When a bunch of jerks get sentenced to go on Mr. Bonestripper, a roller coaster ride of murder, a Poison-esque metal song plays as all the characters are brutally killed. How funny! Later, another group gets caught in the town, but when Aykroyd finds out they're musicians, he wants to hear them play a song. So, we get a six-minute musical number. That's random enough, but try to guess who's doing the musical number? Don't bother, it's Digital Underground featuring Tupac in his first film role. Spider-Man 3 had a few problems. Mostly the script and all the character choices. But the thing that pushes it over the top of badness is its lame soundtrack. First of all, Sam Raimi thought what the Spider-Man universe needed was more dance numbers. Spidey himself has two full dance sequences, both as unimpressive as that sounds. When Peter first goes bad, he does what all bad guys do: performs a disco number on the streets of New York. The movie's failure to get any real Bee Gees song, having to settle for this generic disco track, is just sad. That's not all. Peter's got more dancing to do! He shows up at a club where Mary Jane is performing, only to hijack her number to sing/dance "Fever" to Gwen Stacy. This goes on for three and a half minutes. Tobey Macguire isn't known for his dance skills, and you can see why in this boring, bizarro number. Plus, the music quickly abandons "Fever" and goes with some uninspired instrumental jazz, the kind of thing you'd play if you couldn't get the rights to a song, so you get the next best generic equivalent. Thankfully, in the Spider-Man reboots we've seen since, they've taken his dancing shoes away. Whether you loved or hated Suicide Squad, we should all agree that the soundtrack had some real abrupt moments. For the first 20 minutes, every scene is accompanied by a super on-the-nose soundtrack choice. When Harley Quinn is introduced in jail, we hear "You Don't Own Me." When thief Captain Boomerang comes on the screen we hear "Dirty Deeds Done Dirt Cheap." "Sympathy for the Devil" starts to play, and out walks Amanda Waller. How appropriate! In one scene, you get "Seven Nation Army" when the squad first gets together, then "Without Me" ("Guess who's back/Back again/Shady's back/Tell a friend") when the gang all get their weapons back. You could just read this paragraph and know more than half the movie from the song titles alone. It's not that any of these songs are bad. They're all pretty great. But when you're knocked over the head with constant pop songs that tell you exactly how to think and feel about the scenes, it gets old, and you realize the film is treating you like a moron.